Cape Honeysuckle (Tecomaria capensis, sometimes referred to as Tecoma capensis)is a sprawling fast growing evergreen plant that acts as a vine that reaches 10 feet, or as a bush when kept pruned. 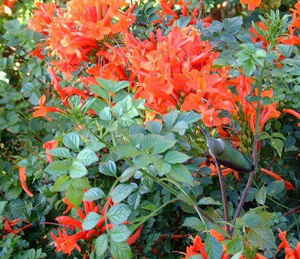 It is covered with brilliant orange to scarlet tubular flowers that bloom from late summer through winter. They are a favorite with hummingbirds. It blooms best in full sun to part shade. Propagate from cuttings, layering, or division of the root ball, but seeds are difficult. It is lightly salt tolerant and does well in various soils including sand. This show stopper is native to South Africa. It grows well in central and south Florida (zones 9 & 10) and anywhere that citrus thrives. It performs well in coastal settings.